ok wow! sorry for the update overload. over the past few months we have been busy. we have been working outside and spreading mulch and planting flowers and trimming shrubs. we have had lazy weekends and busy weekends. we are working on the silent auction and on getting things ready for summer trips because we know they will be here before we know it. we have watched tv, had some great dates, had some fights, did some shopping, dreamed of our vacation, cried, laughed, and prayed. we have been bored and entertaining. we are just loving being in love and enjoying our time we have together and missing each other when we are apart. i don’t remember where i have left off with my work drama. just a quick update. i asked for a raise and instead of a raise they hired two more people. hmmm so much for a financial freeze. they are in the process of “restructuring” so we will see what happens now. i will say that i was moved. i don’t have the annoying neighbor that i did. lunch is actually peaceful and i am not as ill as normal when i leave because of my new desk location. i am still trying to get it organized. i have been training one of the new employees so my desk is a bit messy these days. i am glad that one of the people they hired will help with about an eighth of my work so hopefully when we go on vacation now it won’t be so backed up when i get back. i guess that is about all the updating i want to do on work…. we have some amazing youth. they are crazy and they get my sarcasm (most any ways). i have a blast picking on them and allowing them to pick on me. they helped with the easter egg hunt and they did a wonderful job. one of the perks for me was that cj (our niece) came to the easter egg hunt. she was so funny to watch. she didn’t fully grasp the idea of putting the eggs in the basket, but we helped her and she got a ton of candy (i am sure her mom and dad will eat most of it). but it was wonderful to see the youth hiding the eggs and helping the little ones find the eggs (even if one of the youth patted cj on the head like she was a dog). the youth are wonderful and i love them all so much. we are getting ready for the beach trip and i am so excited to go this year. i will admit i was looking forward to working on some quilts when i wasn’t going but now that i am…i am willing to give up one weekend of quilting and alone time to babysit chill with some crazy youth. one thing that constantly amazes me with the youth is that they listen even when you don’t think they are. andy lead service on sunday (for the early and late service). he did a wonderful job and preached a sermon that needed to be heard. i know that i am biased but he really did a killer job with it. at one point i was almost in tears because i felt close to God and i’m not sure i have felt all that close the past few sundays. in sunday school the kids do pows wows and holy cows (worst best and closet time with God that week). the sunday school teacher told andy that all the kids holy cows were specific from his sermon. i think it made andy feel good, but it made me feel like there is hope with the youth…like when i yell at them to buckle up and to drive careful and to be nice…maybe they hear me and maybe they will apply what they are hearing. one thing that makes me sad about the youth is that andy interviewed today at another church. i know that we need to leave the church we are at, but it doesn’t mean i don’t love the youth and that i won’t miss them if/when we leave. i pray that the interview went well and that if we are meant to leave God will show us the way. i hope that where we end up next we will be there for a while and that we will be able to do amazing things with that part of our life. i have talked to andy tonight about his interview and he is currently on the way home so i will hear more details about it tomorrow. we shall see. i will admit that i am green with envy because my parents have been out of town for almost 2 weeks. they are in sunny destin. i have talked to them a few times and they are having a blast. but andy and i have booked our trip. we are going in may to celebrate our birthdays and our anniversary. for our honeymoon we booked a cruise but had to cancel it because of closing costs. since this is our 5 year anniversary we decided to take our trip and cruise. we are so excited. i am counting the days. we are still working on things for the ride down but i think we are going to stop at sea world to break up the ride down. we leave charlotte in 19 or 20 days. depending on when we decide to leave. can’t wait to post pictures when we get back. i have been working on a few quilts for different Christmas gifts. i will admit i am making for us. we don’t have a quilt that will fit either bed for Christmas and i think that will help transform the rooms at Christmas. i have mentioned before to a lady at the church – ann price – about learning to hand sew. she has taken me under her wing and got me started with a small project that she is going to turn into a pillow. i also mentioned to ann that i had a pieced top of a quilt hand stitched by my great grand mother that i wanted to finish. when i went to ann’s house we talked about what i need to do so that i can get the quilt set up and worked on. we are planning for june when andy is gone so that i can leave the quilt rack set up and not move it. i also have the back done for the tee shirt quilt. i am going to work on it soon. i was looking on line tonight and i found another type of quilt i want to make. i am so excited about it. it is a puff quilt and i will be able to use a lot of my extra fabric scraps to make it. i am going to work on it this summer too. it is fourth on my list. i will post pictures of the Christmas quilts closer to Christmas and once i get the others done i will post those too. i mentioned a while ago that i was loving a new show called revenge. i wanted to update that i still LOVE that show. it has been a wonderful season and i am counting down the shows until the end of the season. i love the end of seasons because the shows are written so well to keep the interest alive for the next season. i hate the end of the season for the same reason because i don’t want to have to wait for the next season. the writing for the show and the concept is amazing. i also love castle. for someone who wants to write (me) it is a fun perspective and i love the tension that has come about this season. i hope that it can end and begin with the same intensity. i will say that i am counting down the days for my summer favorite – rookie blue. it starts back on may 24th. i can’t wait for it to start. 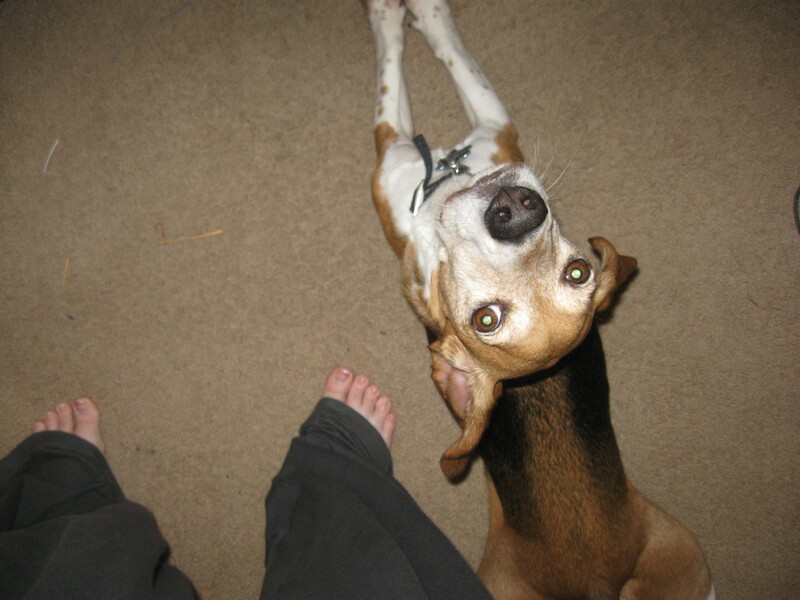 ok well now i have admitted that i watch too much tv and that might be a reason the blog has suffered…. when we moved in the first room we did was the office (because we actually had furniture for that room). 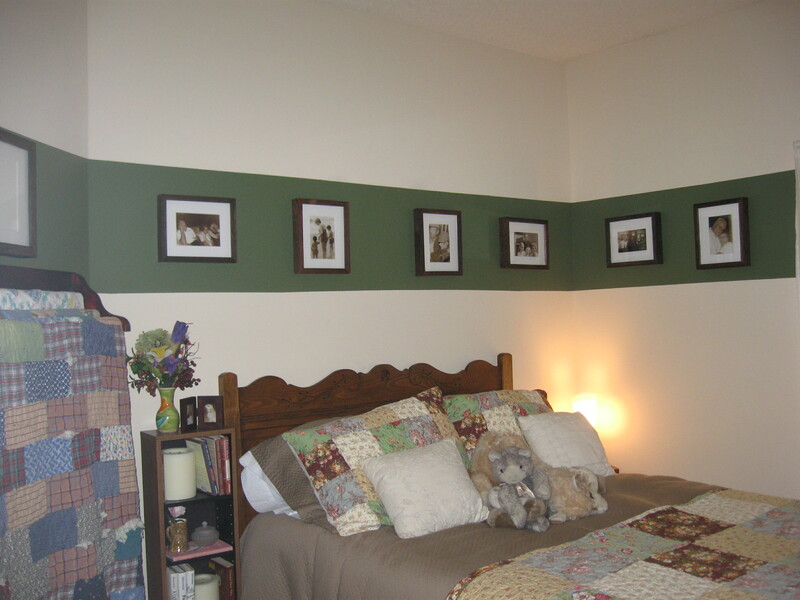 the next room we worked on was the guest bedroom. i loved the room so much. we painted a teal stripe around the room (to cover part of the wall that had some marks on it but so we didn’t have to do the entire room). then we found wood frames (matching in color but not shape or size). we found some pictures of family and printed them in sepia. 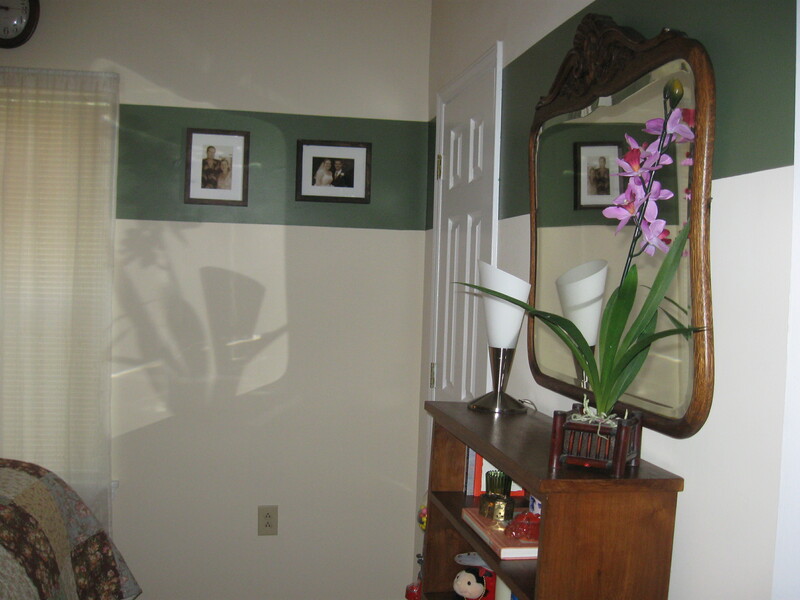 for almost 5 years i have loved that room….then i didn’t love the teal and the mixed frames drove me crazy. lucky for me my parents love auctions and for some reason bid on box lots. they got a lot of frames – that matched. i don’t have before pictures to post but i have some after pics. 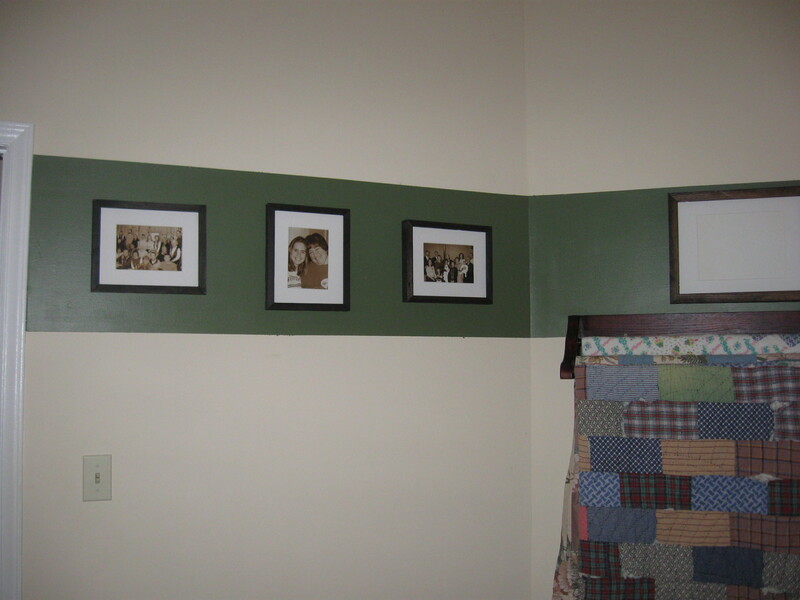 above the bed from craigs list with the quilt from my parents (our 1 year anniversary gift) in the frames that match and have mats are pics of family. i know that you can’t see the pictures but from left to right. 1. andy’s pappy and nana and aunt frances 2. andy his mawmaw and brother 3. grandmama and papa 4. dee dee ray my mom and dad 5. me andy erik maggie katie and chris at katie and chris rehearsal dinner 6. andy’s parents ginger and sandy. my parents are on the left and me and will are on the right. the mirror on the right was from the auction too. it matches the bed wonderfully! from left to right my family picture at Christmas a few years ago. in the middle is my aunt and i and the third picture is andy’s aunt and extended family. 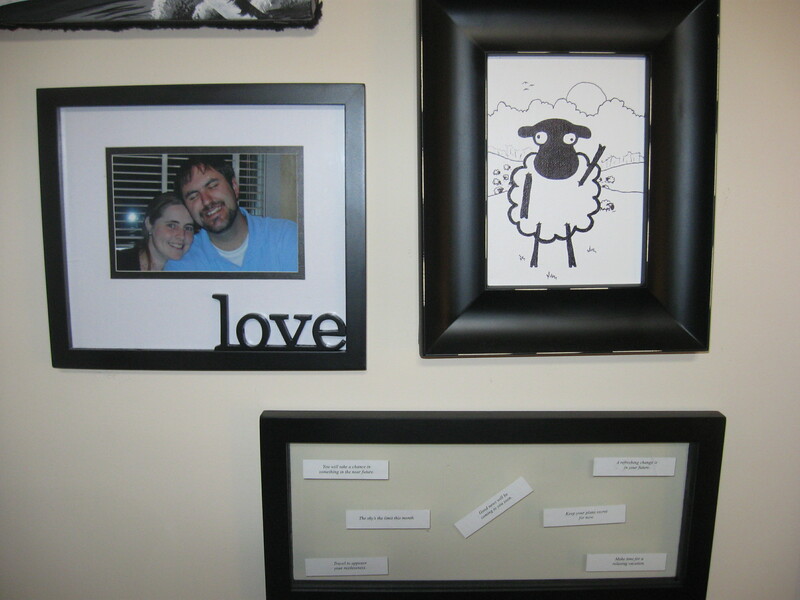 the last frame above the quilt rack that sits empty will have a picture from our wedding. we had a few group shots and haven’t decided which one to use yet. this way we will be able to have everyone in our “family” room. this vase if from andy’s grandmother mawmaw. after she passed away i got it. a few months before she died my grandmother and grandfather passed away. at their funerals i took fake flowers to remember them by. this vase was the perfect place to put them. from each funeral i go to i take a flower. i have started to label the flowers with tape so that in the future i can remember which flower represents the lost. 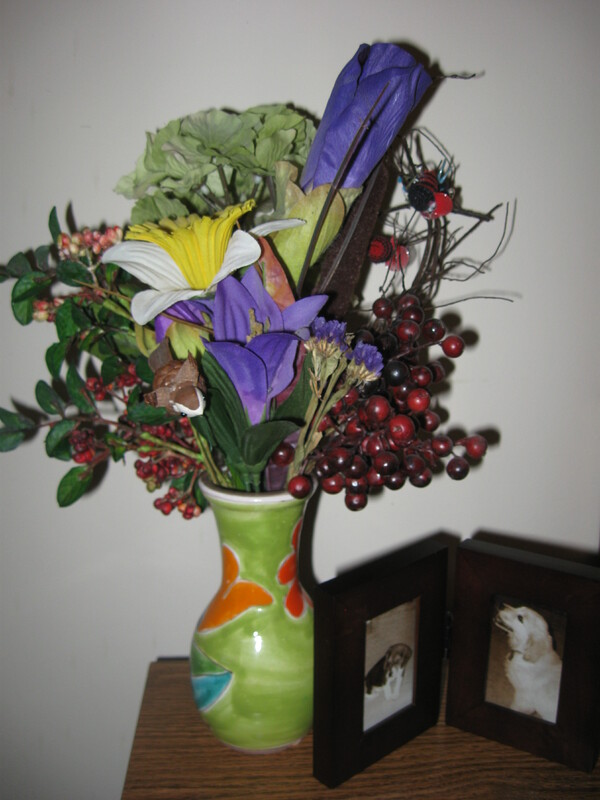 i love looking at those flowers and remembering the people who made me who i am and andy who he is. i love how this room turned out and spend extra time in there looking at all of our memories. there are family quilts and a suitcase full of wedding memories and books and other gifts from family members. i love how it turned out. we have finally finished the collage wall. we had some ups and downs with it. otis broke the glass in the frame, we had to paint/draw our pictures. we had to agree on pictures and we had to actually take time to hang the pictures. 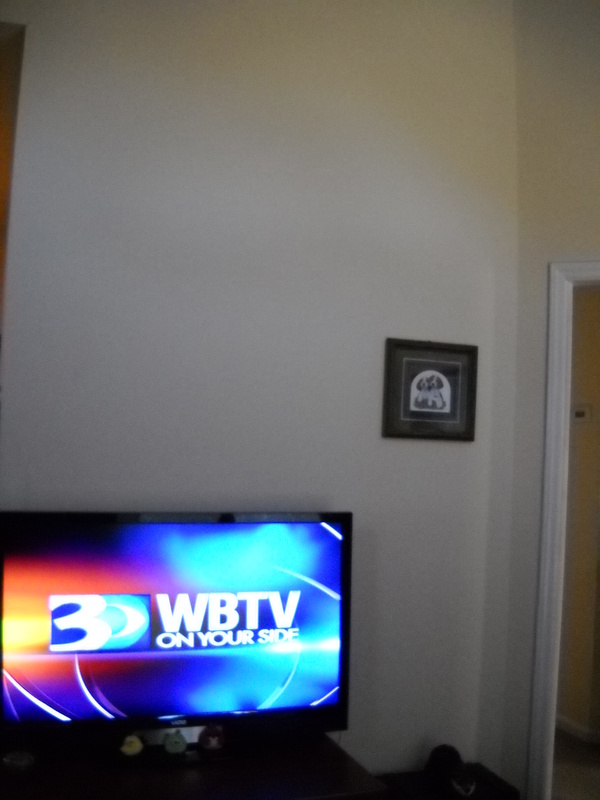 ignore what is on the tv and the bad photo. this wall has been plain ever since we got the house. 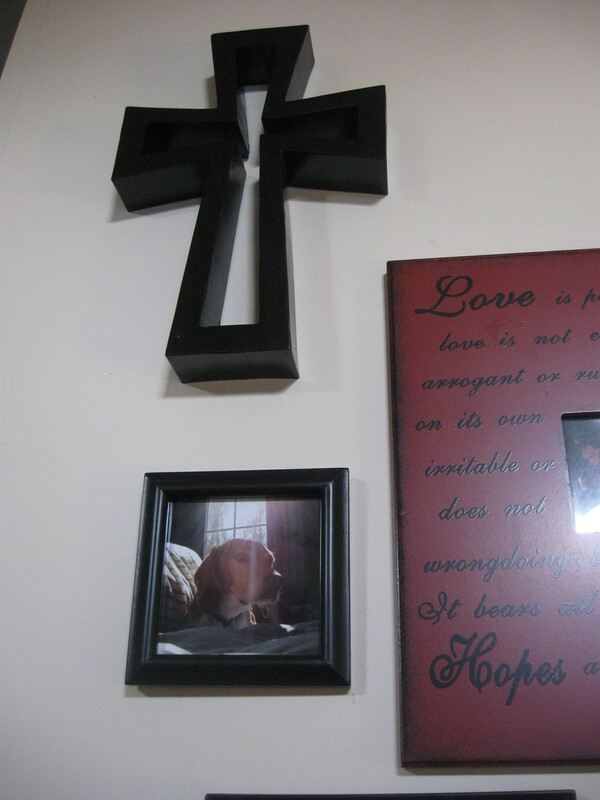 the picture on the wall was moved to the hall since it didn’t fit our theme of frames for the collage wall. 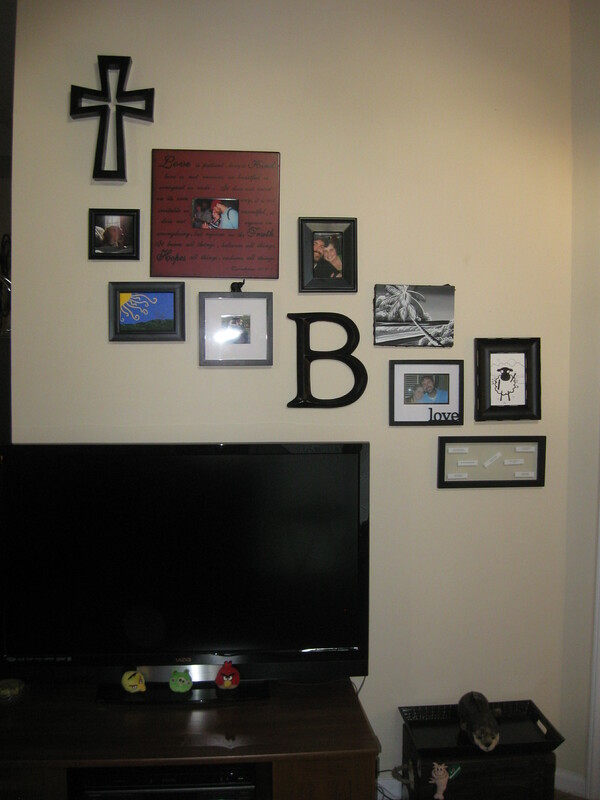 we wanted all black frames with color pictures. i found the red frame and wanted it to be in there too…so it isn’t black but it matched better than one wood color frame. the bottom picture is of several fortunes from when we were praying on what we needed to do as far as jobs and some other things. they made us smile and even though we don’t believe in the – they gave us some hope. the sheep is sherman. i love when andy draws and i love his sheep. it makes me smile and laugh all the time. i knew i wanted that on the wall. i wanted to walk in from a bad day and smile – and i do. the next picture was taken at olive garden after my graduation. it is just a fun picture and i loved it! we felt it was important to include our family name some how in the wall so we added a B. we wanted the B to be in the middle since our family is the center of our wall. we bought a gold B at hobby lobby and spray painted it black. to the right of the B you will see part of a picture we got for Christmas from katie and chris. they got it on their honeymoon in the dominican. above the B is a picture andy took of us at the brad paisley concert. it was a wonderful night. andy got me tickets for our 2 year anniversary. i would have to say it was the best concert i have been to so far. 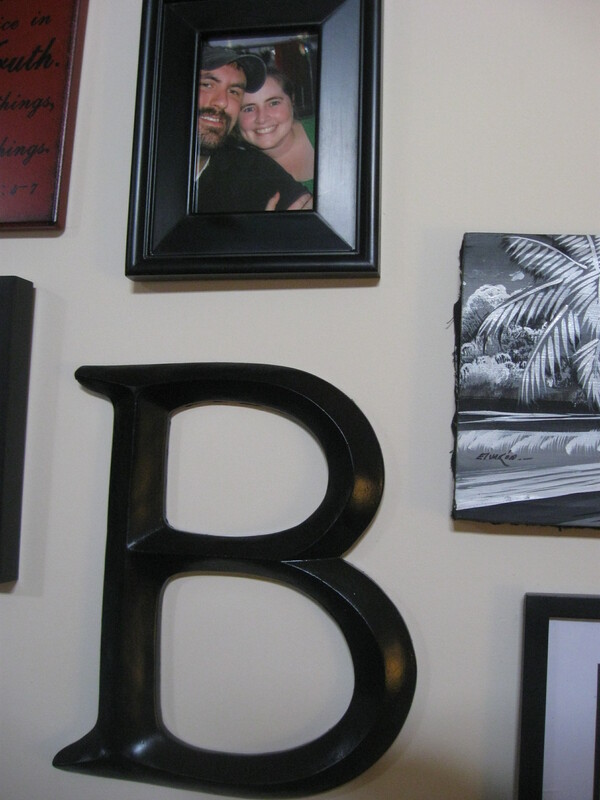 this picture to the left of the B is a picture of us from our wedding. it is a long story as to how why we took blind folded pictures but the short end is we wanted to talk face to face before the wedding but we wanted to keep the tradition of not seeing each other so we ended up blind folded. to this day it was one of my favorite moments of the day and i am so glad that it was captured on camera. above the wedding picture and beside the concert picture is a picture of us at montreat. we have such a history with montreat that it will forever be special to us. this picture was captured in 2002 a year after we started dating and after leslie died at the candle light service. this picture shows raw emotion and love and brings out a lot of bitter-sweet memories for me. 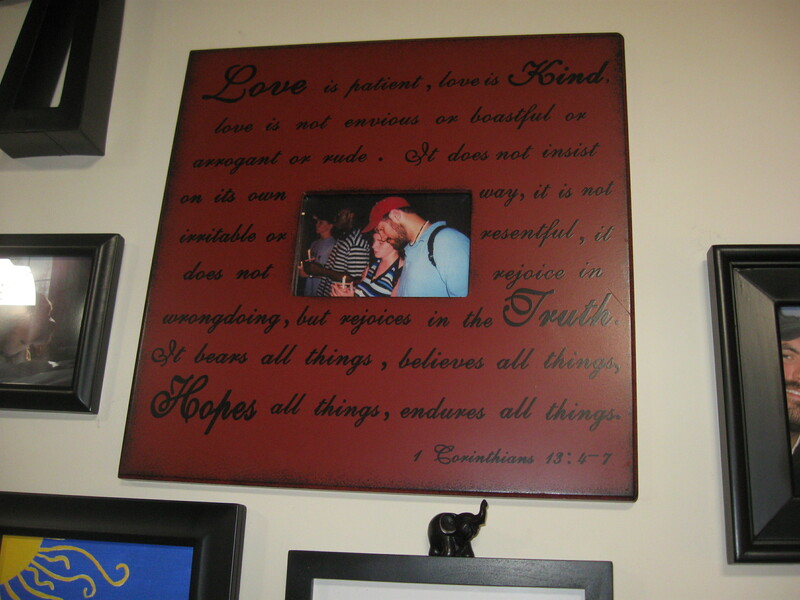 i loved the red frame and the scripture that was on it so i wanted to include it on our wall. this little guy sits on our wedding picture. we found him on sale at hobby lobby and i couldn’t put him down. 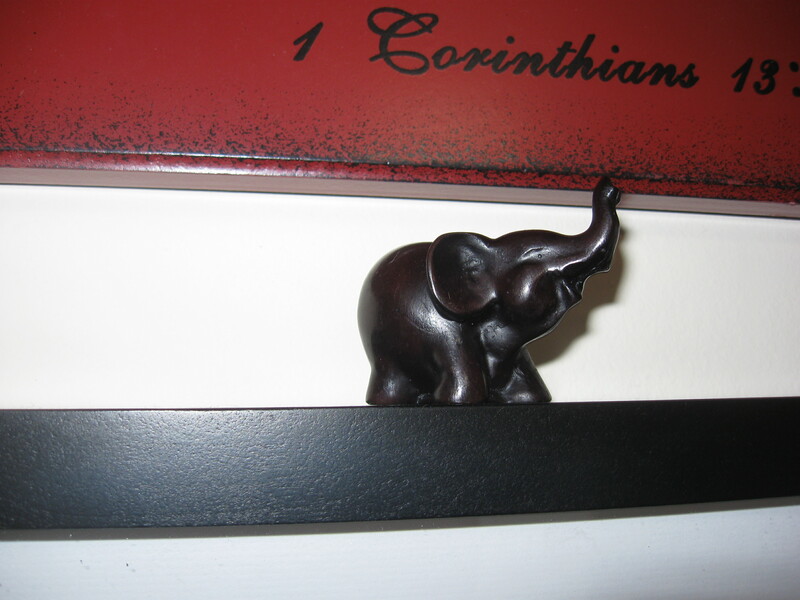 he makes me smile and his trunk is up so he should bring good luck. 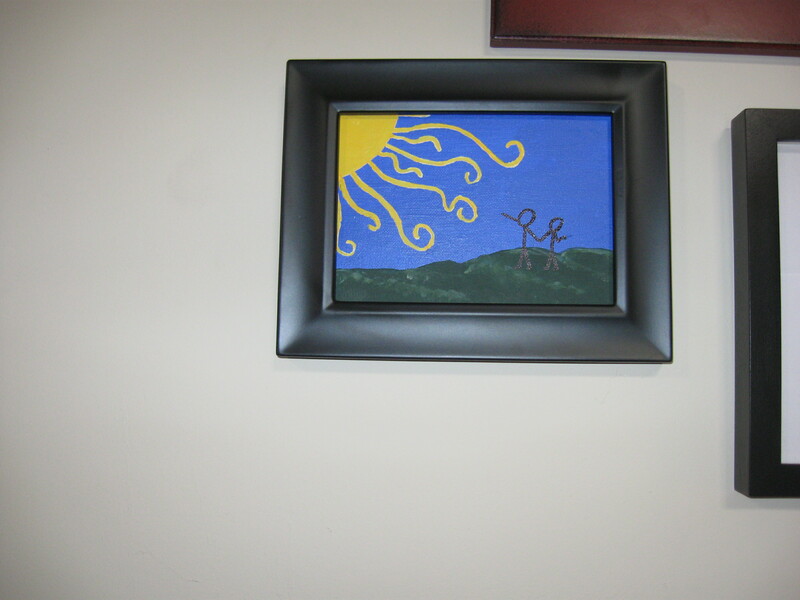 this is a mini version of what i painted for claire. andy wanted loved it and wanted me to paint something so i painted that again. i love the bright colors. we had to include otis! we love our gee. we also wanted to add God into our wall so we added a spray painted cross to the top so that we can remember where we have been and where we hope to go in the future. i am so glad that we are done with the wall. i love looking at our wall and smiling at the memories. i have promised some pictures of home projects so here they are. in our kitchen we had a shelf of shot glasses (i don’t know why or how we became collectors of shot glasses but we have a small collection). 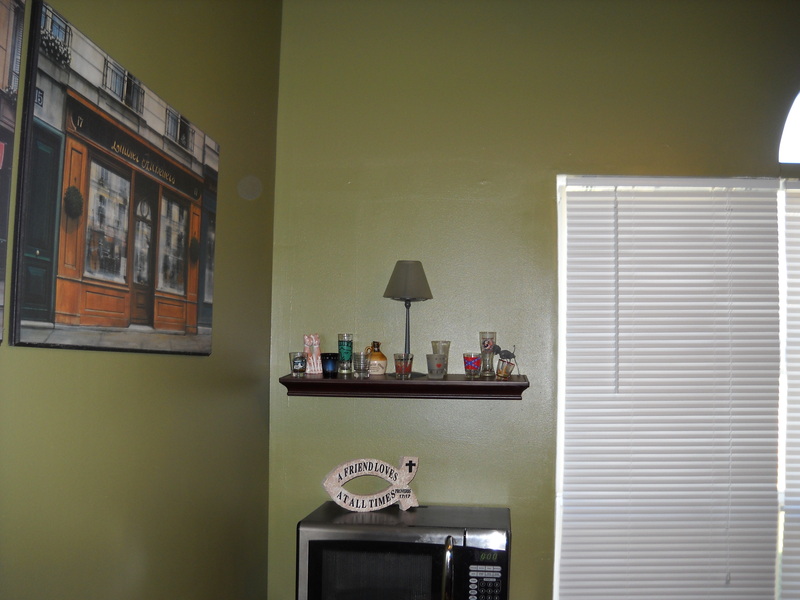 we had 2 shelves on the wall and when we painted the kitchen we bought one larger shelf that matched the color of the rest of the wood in the kitchen. this is the shelf before. the glasses are hard to see because they are so close together. also the shelf looks like it will fall down. from the front view it is hard to tell but i was always concerned it would fall. ignore the glare on this. this is the after. we got this shelf at target. 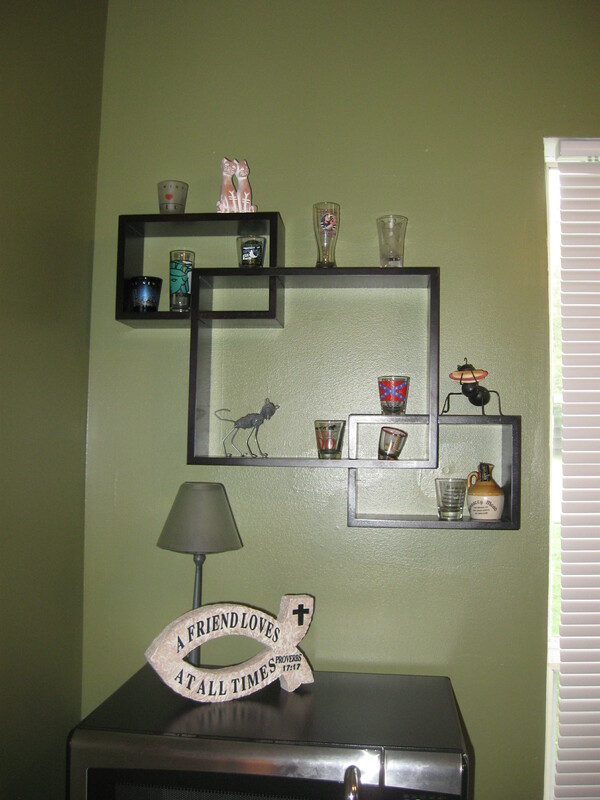 i love that we have a lot more room to add more glasses and i love that the shelf is really thin and hugs the wall. so that is my post on the shot glass shelf. i will admit that i like pinterest. i am not going to say that i love it yet but i definitely like it. i haven’t really had a ton of things to search for but i enjoy just scrolling down the main page and looking at things. i decided that i would use pinterest as my inspiration for katie and maggie’s birthday gifts. i found the cutest purse made out of pillow cases. i was so excited to try this so i ran (drove) to target and got some pillow cases. i cut the material and created this disaster that made me almost cry. i knew what the problem was almost immediately. 1. i can’t cut straight or even and 2. sewing the curve part on the strap wasn’t as easy as the website said it was. so in my frustration i cut the straps off and decided to keep it as a makeup type bag. i am going to sew velcro on the inside to keep it shut. anyways i found another idea that i wanted for our house but we just don’t have the space (or the thought/organization) for it. it is a collage frame with 8 picture frames. once for each day of the week and one for a title. you can use dry erase markers to write appointments or menu or whatever you want on the days. i was so excited and they both seemed to like them. i will try to get a picture and post it later (but don’t hold your breath). i have a few things pinned that i am going to work on this summer.